Perfect weeks like the hot (but not too hot) one we’ve just enjoyed here in western New York remind me how good summer is for so many things other than birding. In terms of bird watching though, ’tis not the season to be jolly unless you’re either utterly devoted to your local resident species or on vacation in a place you might enjoy someone else’s local resident species. Fall migration will be here soon enough; for now, I want to soak up the sunshine. My best bird of the weekend was the energetic Red-tailed Hawk that appears to live right beside the pool my kids and I visit. Corey did a bit better, enjoying tons of juvenile Yellow Warblers at Jamaica Bay. 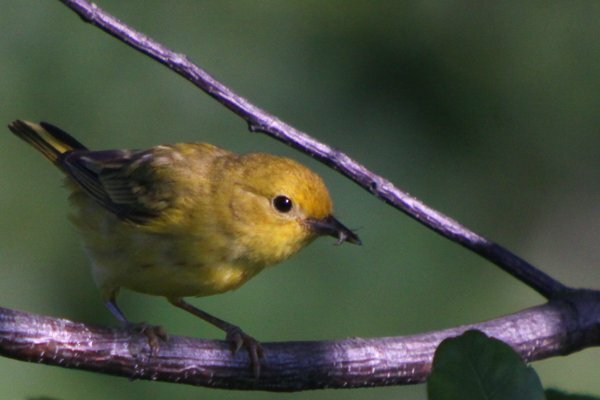 A female Yellow Warbler, exhausted from being constantly hectored by her young. Common Swifts over Heidelberg, gathering in large “swarms” – it’s the final countdown, soon they’ll be gone. I made the hike out to Breezy Point Tip to find the Piping Plovers which was a lifer for me. Although it is a ~10 mile round trip from where the Q35 drops off, so now I am also glad that I won’t be tempted to make that walk again in the near future. Rufous chatterer for me. Though African pygmy kingfisher is always great and a recently fledged juvenile was being fed all weekend at our campsite, which was rather nice.